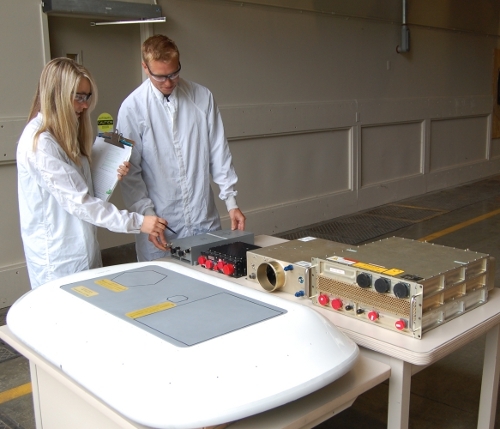 Boeing engineers Stephanie Mount and Chuck Renneberg examine the low-profile phased array antenna (in foreground) and related components that make up Boeing’s new system to deliver broadband to aircraft in flight. HUNTINGTON BEACH, Calif., Oct. 9, 2014 – Boeing [NYSE: BA] has completed environmental and performance qualification testing on the aircraft satellite communications antenna system it is developing for multipurpose satellite operator Al Yah Satellite Company (Yahsat) of the United Arab Emirates. The system has passed customer-witnessed acceptance testing, and its required data transfer rate has been validated in over-the-air satellite tests. Boeing’s system offers a solution to military and commercial customers who require an aircraft-qualified, low-profile, low-drag, easily installed antenna to send and receive data between airborne and ground terminals. The system employs steerable phased array technology, meaning the antenna uses electronics rather than mechanical components to track a satellite, even when mounted on moving aircraft. The Yahsat contract calls for Boeing to deliver the first of eight low-profile antenna systems later this year for installation on various aircraft. Boeing designed and qualified the antenna system in Kent, Wash. Final assembly and testing will be performed at the company’s El Paso, Texas site. The system will be offered to additional customers whose aircraft require low-profile, low-drag agile satellite antenna systems.